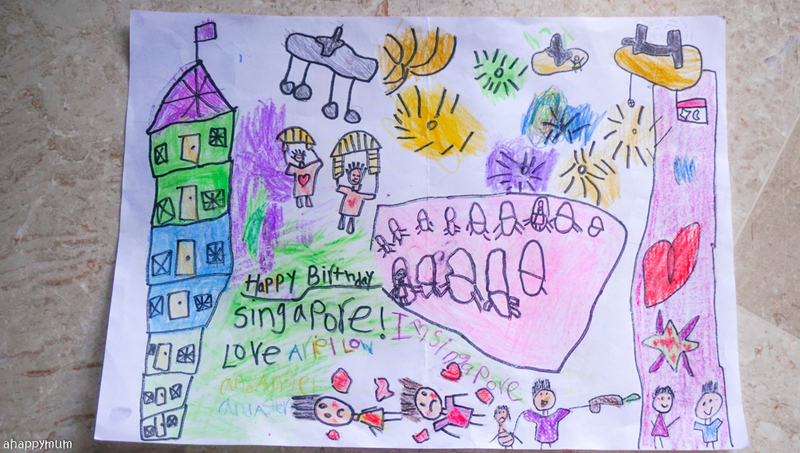 Creativity 521 #113 - Because it's Singapore! It's our nation's 52nd birthday tomorrow! Are you feeling as patriotic as we are? I sure hope so! Although we've watched the National Day preview, we still can't wait to catch the live telecast of NDP tomorrow and we are also gonna have our own mini celebration by hosting a family BBQ gathering too! Woohoo! 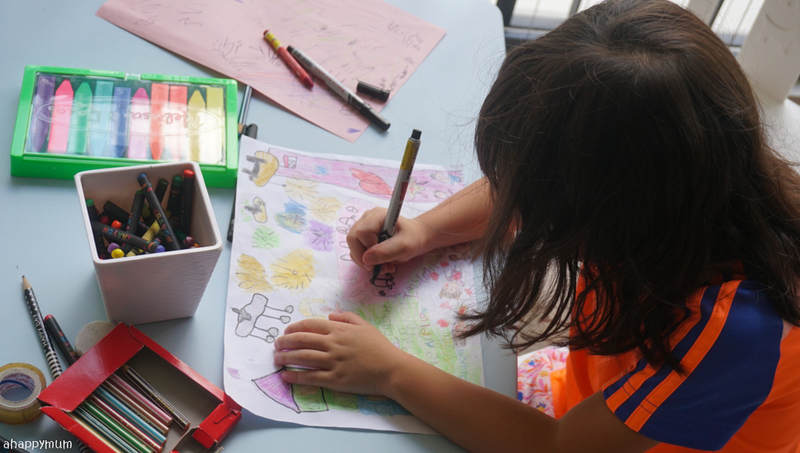 So, I know it's been ages since I posted on Creativity 521 because all I could take time out to do with the kids nowadays is more of just painting and doodling. 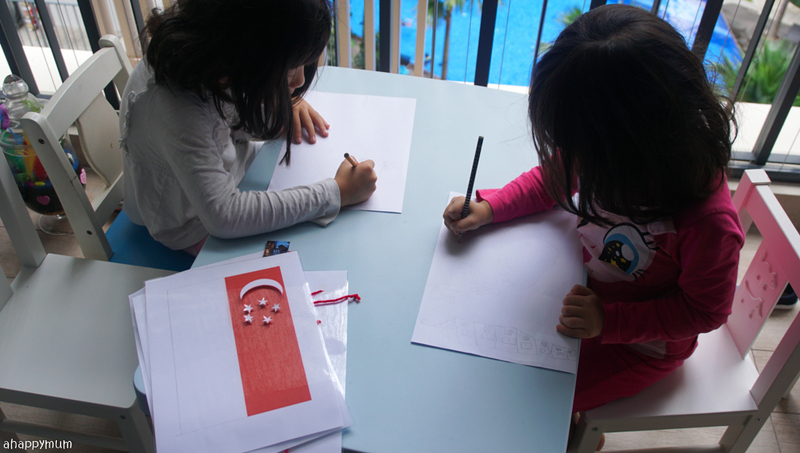 However, National Day is such an important occasion and in wanting to celebrate it while letting the kids learn more about this country we call home, we did some simple National Day activites. I designed our materials with a few objectives in mind and catered for each kid's age group and learning ability. 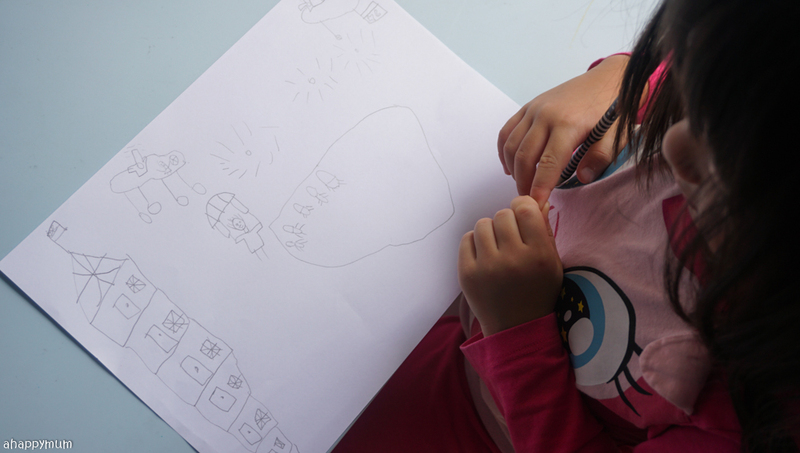 For Angel, she has been showing curiosity in learning and I wanted to let her have the chance to learn about National flags around the world. 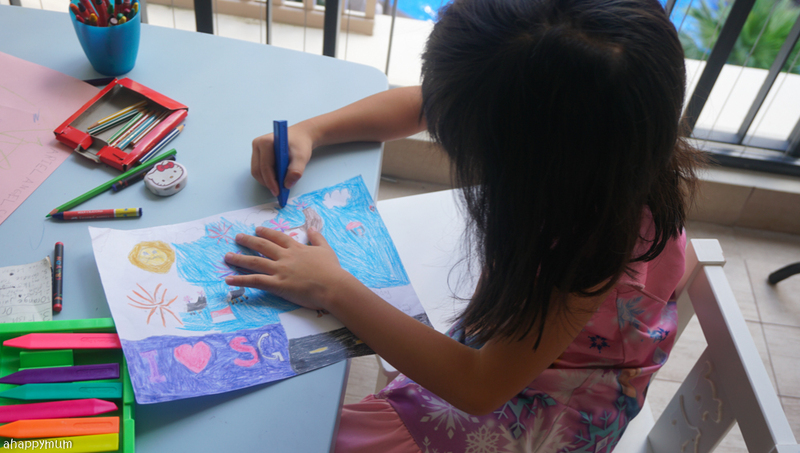 For Ariel, I wanted something with letters so she can work on her reading and phonics, so I decided to let her learn about Singapore landmarks. 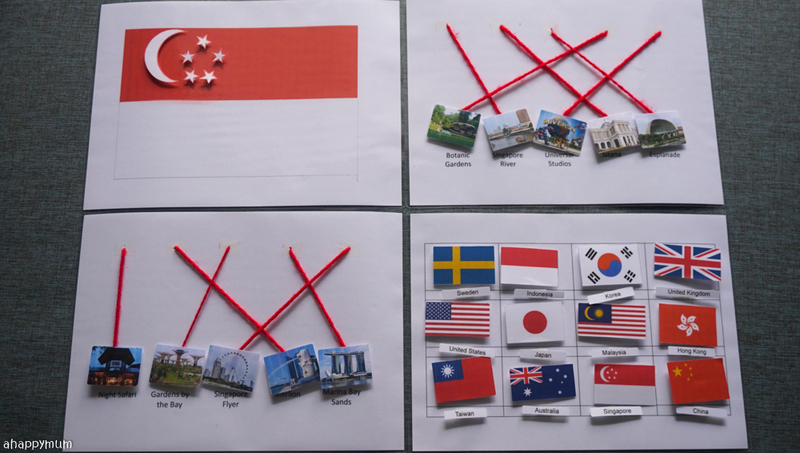 As for Asher, well, let's start with the basic and that is to recognise the Singapore flag. Firsly, I designed my activity sheets on Powerpoint, which is the program I usually like to use. 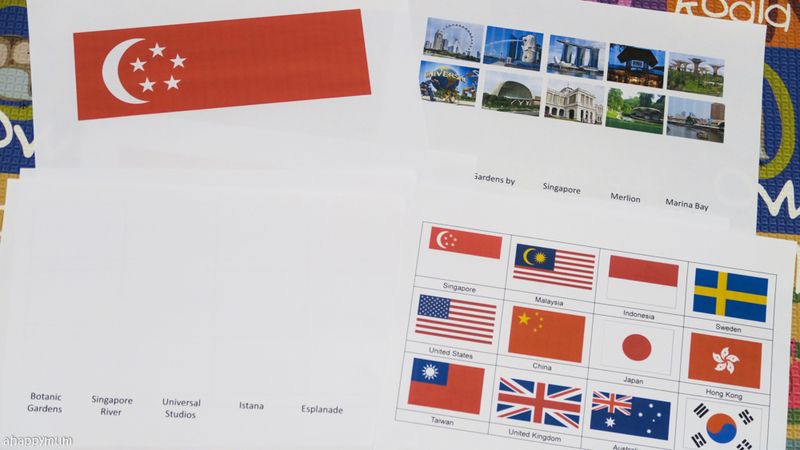 For instance, I did up a table and put in the flags and their names, I searched for pictures of Singapore landmarks and typed out their names, and I did a printout of a high-res Singapore flag. 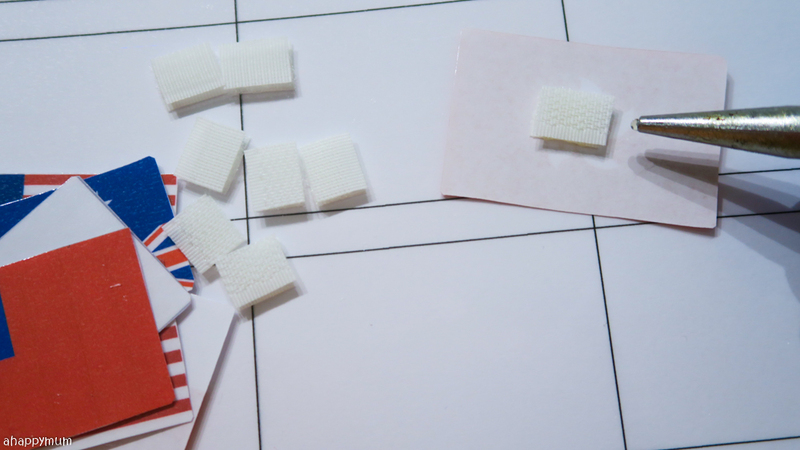 You have to do a little planning on what you want your child to be able to stick/remove for the learning activity, do the layout and then print accordingly to what you need. 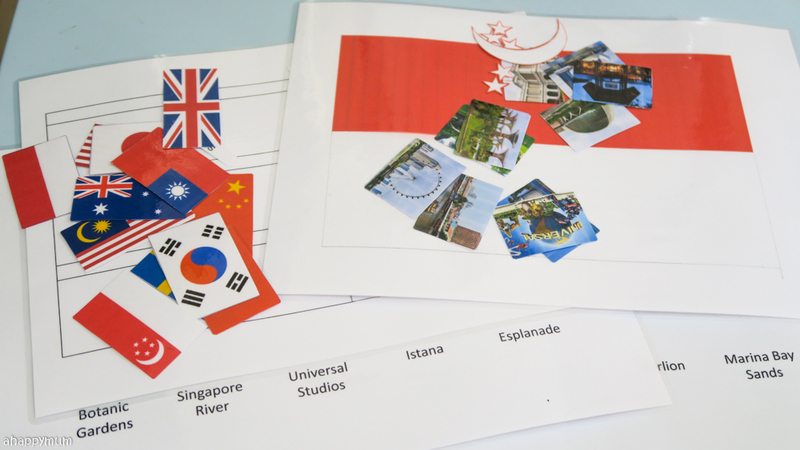 Once the printing was done, I laminated the sheets and cut out the flags, landmarks, stars and crescent accordingly. Then, it's time to stick! Using velcro lets the child use and re-use the activity sheets for as many times as he/she likes so I'm kind of liking this idea. What I did was to hot glue small pieces of velcro behind the cutouts and on the positions where they should be, or can be, stuck on. 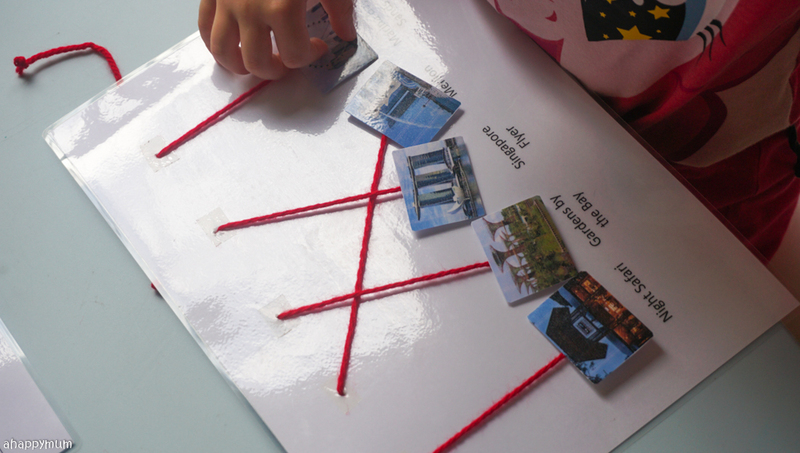 For Ariel's activity, I pasted strings onto the cutouts of the landmarks so that she could do some pulling and match the landmarks to their names before sticking them with the velcro. 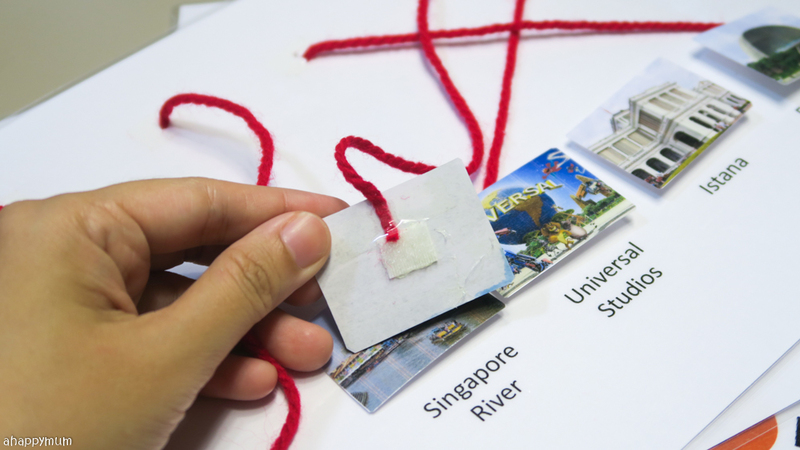 To secure them to the activity sheet, I poked holes, inserted the strings and tied knots at the back to secure them. The gluing took me longer than I expected but here's what I achieved at the end of the day. Yup, you can tell how these simple learning activities work right? 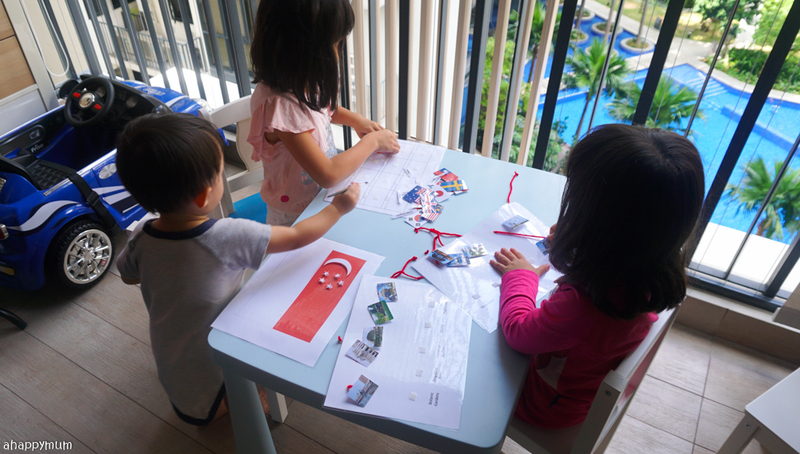 Angel just has to match the flags to their names, Ariel has to read out the names of the landmarks and match accordingly while Asher can just have fun removing and sticking on the cresent and stars of the Singapore flag. And indeed, they did have at least an hour of fun playing with these new activities! Woohoo! 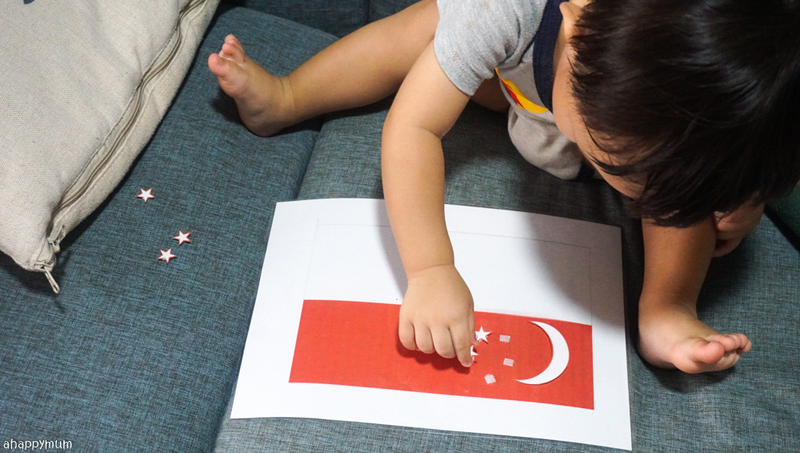 The boy was happy to keep taking off the cutouts and the fact that the stars are so small makes it harder for him to stick them back - a great chance for him to train his patience, work on his dexterity while learning how our flag looks like. As for the little sister, she had a little difficulty reading some of the names of the landmarks but that's the thing, you learn as you go along, right? As for the big girl, she was the one who surprised me most because she could remember and match the flags correctly to their names within a couple of minutes. 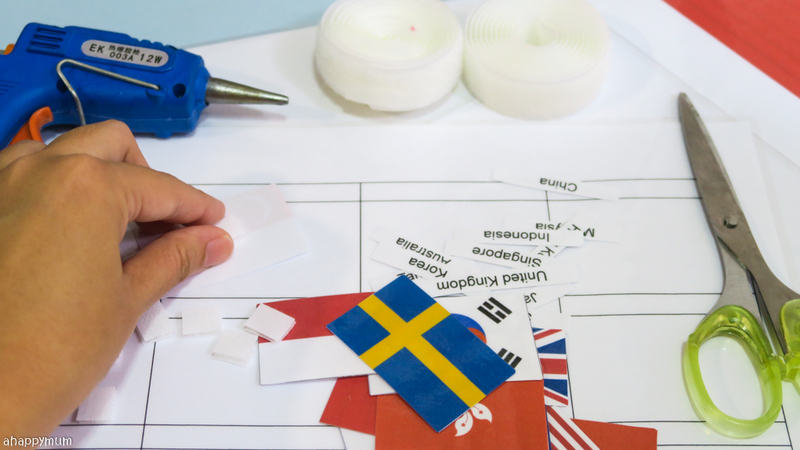 Eh, was it really so easy to remember all 12 countries' flags? Anyway, she did her own improvisation and she made sure she even remembered the positioning, which is the sequencing of the flags in the table. I guess I will have to print out dozens more flags soon so she can start learning more about the world! Since we watched the NDP preview, which was a really memorable event for us, I wanted them to capture those memories while they were still fresh in mind. So, I tasked each of the girls to make a drawing of what they remembered from the parade and include their favourite highlights. I thought it wouldn't take them too long but it ended up that we took days to complete this because they really made an effort to draw the things they liked before colouring their drawings and outlining them too. 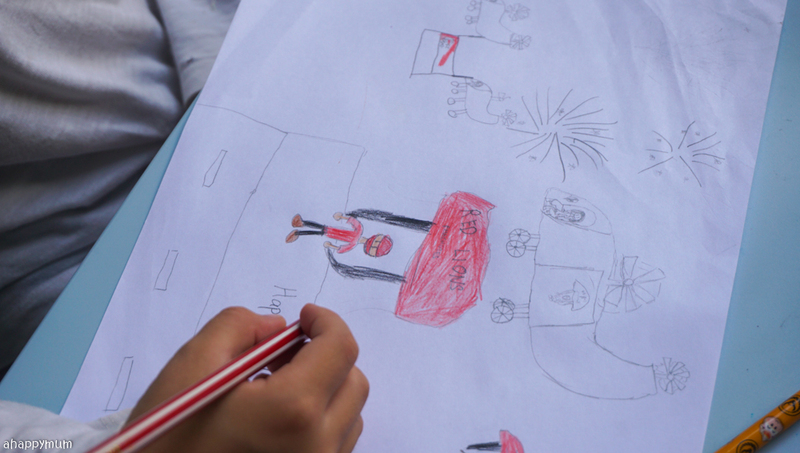 It was kind of heartwarming to see them trying to draw the Red Lions, the military display (most memorable for them was when the good guys walked right up to us and shot the bad guys with their guns), the flag flypast and the fireworks too! The one good thing about having a laminating machine (you can get one at Popular for a low cost) is that I get to laminate all their precious drawings so that we can keep them intact for a long, long time. These drawings will definitely go into our collection and be a part of our fond memories too. Here's a look at their completed work. 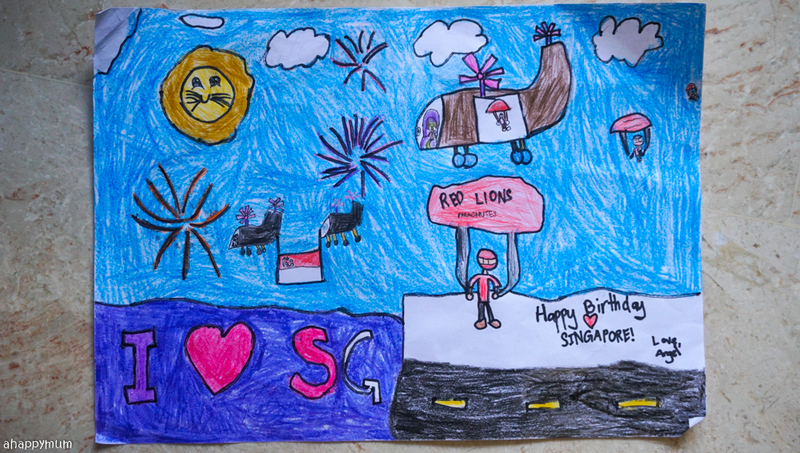 Dear Singapore, I hope you feel these little girls' love for you! I love you so, so much too! Proud to have you as my home and here's wishing you a happy 52nd birthday! P.S. The girls have been singing this National Day theme song day in day out. They sing it in the car, at bedtime, in their spare time and even when they are taking a shower. Yup, we don't care about all the criticism people have about this song, we love it and we feel proud to be able to sing it as Singaporeans. For more crafts and DIY tutorials, visit my gallery here.